Based on commercial electronic scales the gravimetric (fill by weight) units offer accurate and rapid filling of containers up to 200 litre capacity. Two different basic models - 1200 (0.5 -20 litres) and 1201 (20 - 200 litres) - are available in either top fill or sub surface (bottom-up) fill configuration. Sub surface fill mechanisms incorporate a hydro-pneumatic drive for the lance, to facilitate precise synchronisation with the fill rate, and also include a feature which ensures that the lance does not retract from the container before the fill is complete. All machines incorporate a two-stage cut-off and non-drip nozzles to ensure accurate and clean filling of a wide range of products. All product contact parts are manufactured from stainless steel or suitable plastics, and construction is generally corrosion resistant. Flow rate is adjustable for both the bulk and dribble phases of the fill - provision must be made to pump or gravity feed product to the machine at compatible rates. 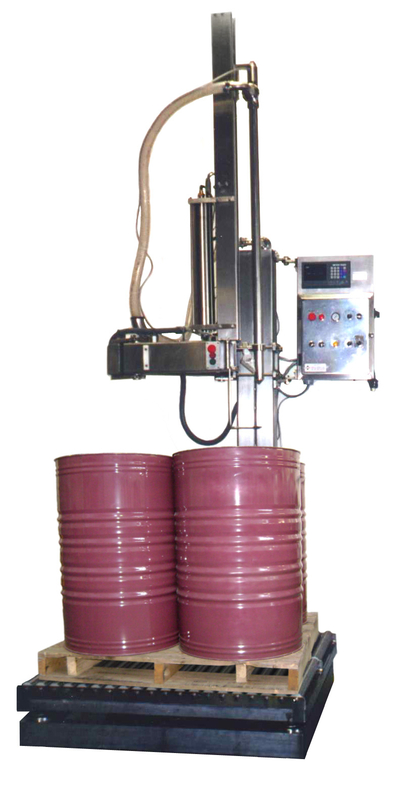 Bulk filling system for accurate filling of liquid products into jerry cans, drums, IBC’s. Gravimetric (fill by weight on scales) or flow meter control for measuring the fill. Top fill or controlled sub-surface filling options with fixed or pantograph nozzle mechanism. Able to fill 4 drums on a pallet with disc brakes on pivot points during fill cycle. Pre and post nitrogen purging of vessel during filling cycle. Output up to 10 tonnes (50 x 200 litre containers) per hour. Two stage product shut off for maximum accuracy. A range of shut off nozzles for clean filling and drip catching outside the lance. Various degrees of automation achieved with gravity roller and powered conveyor systems. PLC control of all functions ensures exceptional reliability and integration with other equipment. At Hunter Filling Systems we have quickly realised that one size does not fit all. We know from years of experience that every customer has different requirements, so at Hunter Filling Systems we are equipped to address any application – even the most challenging which our competitors would stand clear of. 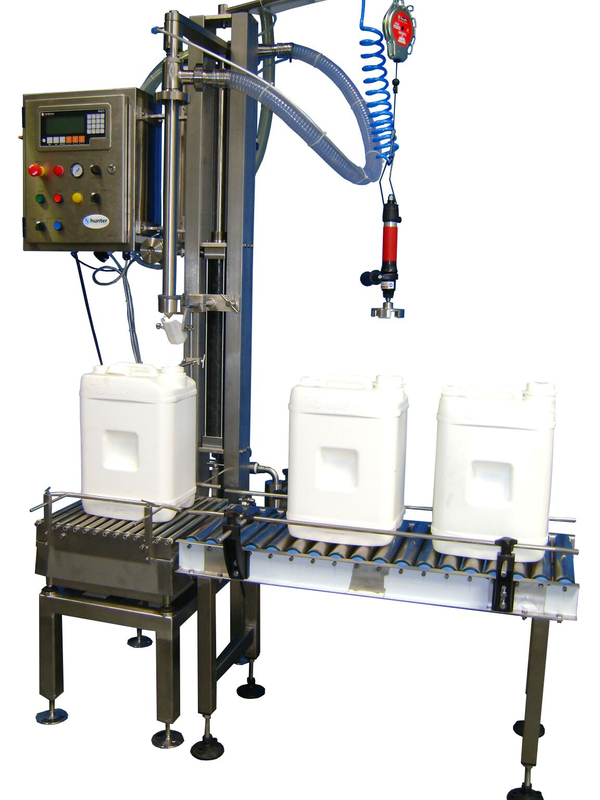 Based on Hunter Filling Systems’ rock solid designs from our standard filling equipment, Hunter Filling Systems has the in house technical expertise to work with customers on a solution or offer ideas. Should you require a custom filling system solution give us a call or send us an unpackaged product sample, with the bags or containers for us to test and evaluate – no obligation.